Arroz con camarones or shrimp rice is a classic Ecuadorian and Latin American dish from the coastal areas consisting of rice cooked in a shrimp broth and mixed with shrimp, sautéed onions, peppers, tomatoes, garlic, cumin, achiote and parsley. Ecuadorians, and South Americans, love arroz or rice, we can’t live without it and eat rice almost every day, therefore we have a plethora of rice based dishes, anything you can think of and there is a rice based dish for it, especially if it concerns any type of seafood. 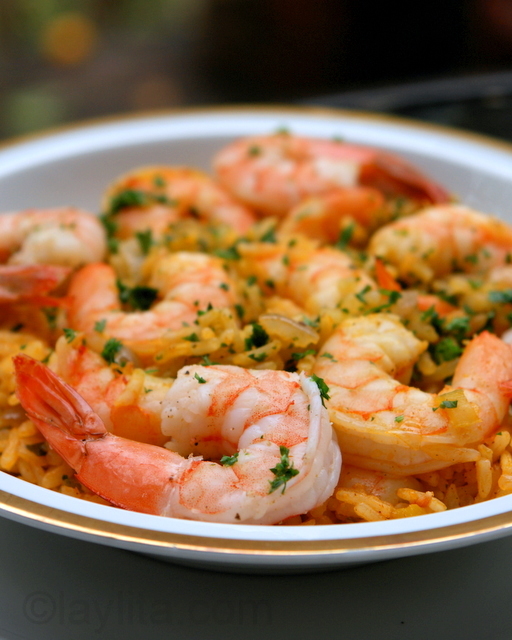 Arroz con camarones or shrimp rice is a traditional Latin dish made with rice cooked in a shrimp broth and sautéed with shrimp or prawns, onions, peppers, tomatoes, garlic, cumin, achiote and parsley. Marinate the shrimp with salt, pepper, 1 tsp of cumin, and the crushed garlic, let rest for an hour. Bring water to boil in a large pot, add the shrimp and boil for about 2 minutes. 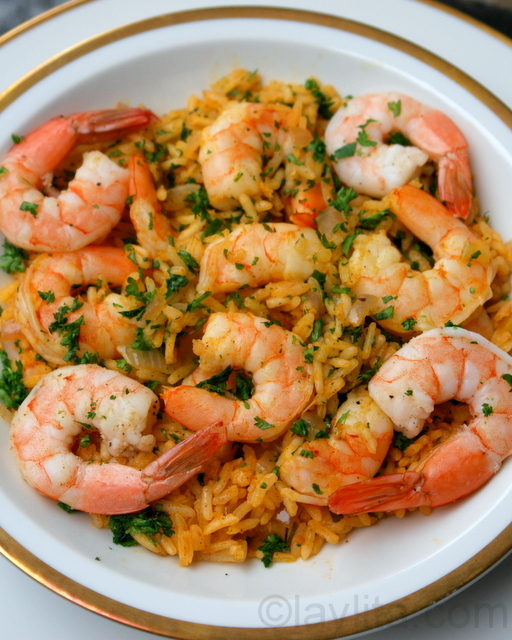 Remove the shrimp from the water and reserve 2 ½ cups of the water they cooked in to prepare the rice. Remove the shells and tails from the shrimp; leave the tails on a few of the shrimp that will be used as a garnish. Chop about half of the shrimp in half and leave the other half whole. Heat the oil in a large saucepan or pot, add the minced garlic, cook for about 2-3 minutes on medium heat. Add the rice to the garlic and oil, mix well until the rice is coated with oil. Add the 2 ½ cups of water that was used to boil the shrimp. Bring to boil and reduce heat to low. In the meantime, melt the butter over medium heat in a large sauté pan; add the onions, peppers, tomatoes, parsley, ground achiote, salt, pepper, and remaining 1 tsp of cumin. Cook for about 10 minutes, stirring often. Add the white wine to the vegetable mix and continue cooking for another 5 minutes, until the onions and peppers are tender. Mix in the sautéed vegetables and chopped shrimp with the rice, which should still be cooking, and cook on low heat until the rice is tender. Add the remaining shrimp during the last minutes and mix well. Sprinkle with chopped parsley and garnish with shrimp with tails on. Serve with avocado slices, tomato and onion curtido salad, lime slices, and of course some good aji or hot sauce. The shrimp are marinated with salt, garlic and pepper and then cooked with the shells on in order to preserve the greatest amount of flavor, this is one of those bits of cooking wisdom that is passed on from generation to generation: always boil/cook shrimp with the shells on. The rice is then cooked in the broth or water in which the shrimp were cooked, and then mixed with a refrito or sofrito made from the onions, pepper, garlic, tomatoes, parsley, achiote, cumin and white wine. I served the shrimp rice with avocado slices, tomato and onion curtido, lime slices and aji or hot sauce, it can also be served with fried ripe or green plantains. Layita, mi esposa es ecuatoriana y le encanta el arroz con camarones. Probé muchas recetas y esta es la que da mejores resultados. Gracias! Last night i tried this recipe and it was fabulous. Thank you for sharing it with us. El vino se puede reemplazar tambien con cerveza, o si quiere reemplazarlo con algo sin alcohol puede usar caldo (de pollo o verduras). Hola, acavo de preparar este arroz pero no me salio como de la foto. Si esta muy rico, pero visualmente no esta muy atractivo. El arroz esta muy pegajoso, y creo que le puse la mescla de vegetales muy temprano. Porfavor, me puede explicar exactamente en que momento se mescla todo para que salga visualmente rico. El arroz debe estar casi listo, pero todavia un poco duro, entonces le agrega el refrito de los vegetales, lo mezcla bien y deje que se termine de cocinar. Tambien, dependiendo del tipo de arroz que use es posible que deba cocinarlo con menos agua o caldo, talvez con 2 o 2 1/4 tazas del agua o caldo de los camarones. Voy ahora mismo a comprar los ingredietes, se ve super bueno. AH y con un vinito por el lado MMMMMMMMMM!!!!!! !